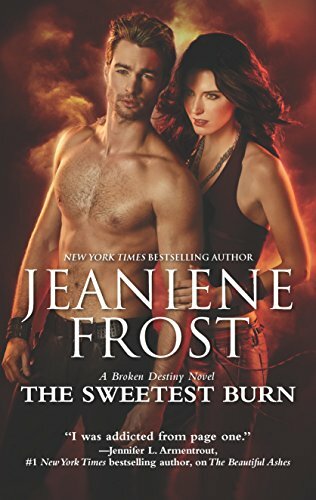 The Sweetest Burn is book two of the Broken Destiny series by Jeaniene Frost. This book begins with Ivy searching for her gargoyle, Brutus, only to end up being chased by minions and demons. She’s saved at the last minute when Brutus arrives on the scene with the man who broke Ivy’s heart: Adrian. The premise of The Broken Destiny series is that Ivy is the last Davidian and therefore “the only human capable of wielding the hallowed weapons that could bring down demons,” while Adrian “is the last descendant of Judas,” whose fate it is to “betray and kill Davidians.” Ivy and Adrian are attracted to each other, but because of their fate, and the fact that Adrian refrained from sharing this information with Ivy earlier (end of book one), their relationship is strained. With the walls between the demon and human realms beginning to crumble, Ivy must face her destiny: to find the hallowed weapon that will repair the damaged walls. Forced to work together Adrian and Ivy must put aside their emotions and concentrate on saving humanity. Along for the ride are Ivy’s roommate Costa, her sister Jasmine, and Brutus. This book is listed under the heading of New Adult & College, perhaps because of the sexual connotations; however, the simplicity of the story seems more suited to YA readers. The book is an easy read with just a few too many easy outs regarding character development and plot points to pull in a mature audience. A majority of Ivy’s dialogue consists of her continual whining about Adrian leaving her (end of book one), and how he lied to her about her destiny. But as Adrian points out, “You asked me to go. In fact, you insisted, remember?” This emotional repetitive flip-flopping makes Ivy seem weak and somewhat boring, not a young woman who has been chosen to save the world. Frost brought readers of the paranormal genre the delightfully naughty and witty characters Bones and Cat (Night Huntress series), and Vlad and Leila (A Night Prince series). The Sweetest Burn is empty of Frost’s previous captivating storylines, and sadly the manuscript is in dire need of a copy edit and therefore difficult to read. Mandy Jackson-Beverly is the author of A Secret Muse and The Devil and the Muse, the first two books in the Creatives Series. She has taught theater and AP art at the high school level and enjoyed a successful career as a costume designer in both film and print.